Dish TV and satellite TV rain fade problem, why your TV signals are affected by the rain. Adverse weather conditions have been known to affect the quality of reception of satellite television signals. This is popularly known as "rain fade". Usually, when this happens, it is only for a short period of time and as a result the satellite signal freezes. In fact, heavy rain and cloudy conditions can affect television signals enough to result in significant degradation of image quality. In severe cases, the reception may be interrupted effectively. Factors that determine how often this will happen include regional annual precipitation amount, location in the satellite footprint and height of the satellite above the horizon. While heavy rain is required to affect the signal reception of a home satellite system properly aligned with satellite. However, it is more likely that more areas with significant annual rainfall as tropical Africa or South America, especially in countries where rain is preceded or accompanied by thick clouds of heavy storms. It is less likely in Europe and some parts of the US. However, it happens, just less often. The main cause of the degeneration of the satellite signal is wave absorption by raindrops. There is also some signal dispersion due to the deflection of satellite communication between a medium and another, or the interference between the waveforms produced by rain or cloud. But not only rain that causes degeneration of the signal. Heavy snowing can also affect the quality of the signal, but in general are less likely to interfere. Not all satellite signals are affected equally. In general, the longer wave radio, is less affected by the "rain fade." Through the transmission wavelength and C band signal is significantly less susceptible to interference such as that performed by the shorter Ku band (which is used by DStv) or the Ka band. Moreover, the central reception area farther location is more pronounced the effect of rain-fade effect. Often the susceptibility to rain fade is symptomatic of a lower plate optimally directed. 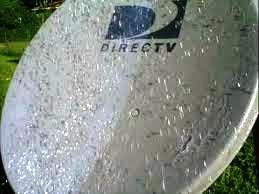 Reception quality can also be affected by water or snow/ice accumulate on the surface of a well plate. This can result in less efficient dispersion and focusing the satellite signal after reflection from the surface of the plate. Very often, an annual maintenance by a home dish qualified service address this. In temperate regions of the world, a special plate with built-in heater is used to prevent ice buildup. Rain fade satellite signal problem is neither exclusive for Nigeria, Africa nor Asia but can be seen all over the world.